The background paper is so pretty and the red gingham ribbon is a perfect match! She made a circle window using a couple of circle dies, I love this technique. :) Thank you for sharing, Carol. Make sure to stop by her blog and leave a comment for her. 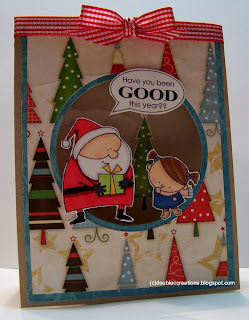 You still have time for joining this month's freebie challenge! Don't miss a chance to win a digital stamp from Birdie Brown.